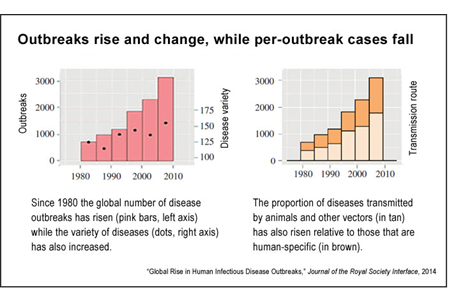 The number of infectious disease outbreaks, as well as the variety of diseases, is on the increase. Improved recording of cases, changes in human behaviour and pathogen mutations have all had an effect. With this in mind, it has become more important than ever to focus on the prevention of infectious diseases in health institutions. The 2014 Ebola outbreak in West Africa dramatically raised awareness of the global burden of infectious disease and raised questions about the preparedness of public health systems. According to the Global Health Policy Centre at the Centre for Strategic and International Studies (CSIS) in Washington D.C. three of the top ten causes of death, or 16 per cent of all deaths each year, are from infectious diseases. At least 30 previously unknown disease agents have been identified since 1973, including HIV, Ebola, Hepatitis C, and Nipah virus, for which no cures are available . In the same period 20 well-known diseases, including tuberculosis (TB), malaria, and cholera, have reemerged or spread geographically, often in more virulent and drug-resistant forms. The number of outbreaks, as well as the variety of diseases, has been rising in the past twenty years and governments, health institutions and individuals have all had to adapt their behaviour to try to combat outbreaks. Against this background, the prevention of infectious diseases is of rising importance. It is possible to prevent some kinds of infections, mainly healthcare-associated infections (HAI), by targeted disinfection and hygiene in healthcare facilities . In order to establish hygiene standards throughout the practice, a deliberate focus on hygiene needs to be established to raise awareness of it as an effective infection prevention method. Which standards need to be implemented, when, depends on the individual case and its infection danger but in most cases, even basic hygiene standards are sufficient. The core messages that need to come across are the importance of hand hygiene and disinfection as well as the use of disposable gloves and instruments. Another factor in improving compliance and, consequently, enhancing infection prevention is to increase employee motivation and training in hygiene management. The introduction of educational training, as well as fostering a culture of feedback and appraisal, can go a long way. Changes in human behaviour are able to constitute to a reduction in nosocomial infections as shown in the report of Chen CY et al. where the introduction of a hand hygiene programme resulted in a decrease of 9% and an increase in compliance to reach 95.6%. It is evident that the promotion of hygiene management standards as well as the implementation of practical guidelines increases compliance, which, in turn, results in the prevention of infectious disease.